In February, DH fellows Katherine Dau ’19 and Colby Gilley ’20 attended the Undergraduate Network for Research in the Humanities Conference at Hope College in Holland, Michigan. 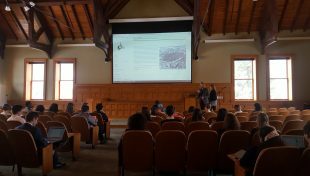 The conference, which is held annually and aimed at building a network for collaboration and providing a platform for peers to share projects, gave Dau and Gilley the opportunity to learn more about Digital Humanities. Dau and Gilley were able to present their project Florence As It Was to fellow undergraduate researchers, receive feedback on it, and explore the projects of other students interested in Digital Humanities. In particular, they were able to learn about ArcGIS, a geographic information system for working with maps and geographic data, and how useful it could be to their own digital reconstruction project of early modern Florence. The keynote speaker was Dr. Jacob Heil, the College of Wooster’s Digital Scholarship Librarian and the Director of its Collaborative Research Environment (CoRE). According to Dau and Gilley, Dr. Heil emphasized the significance of the “betweenness” that comes to represent Digital Humanities. Because Florence As It Was incorporates various skills and disciplines, including website design, photogrammetry, 3D design methods, art history, architecture, history and religion, Dau and Gilley, like many other DH fellows, understand the importance of being able to maneuver between and transcend traditional academic boundaries. Overall, Dau and Gilley highly recommend attending the UNRH Conference to students who are interested in learning more about Digital Humanities projects from around the world, sharing challenges and goals with a community of undergraduate researchers, and becoming a part of the next generation of scholars in Digital Humanities and academia. This post was written using interviews with Katherine Dau ’19 and Colby Gilley ’20.